Garage floors take significantly more abuse than the rest of your structure. From daily vehicle wear and tear to spills, drops, and scuffs, your garage floor has seen it all. Applying garage paint to your floors will help to protect them from a multitude of hazards and keep them looking great. Our professionals can offer garage floor painting in Waco and Temple, TX that can stand up to the elements and keep your flooring looking uniform, clean, and stain free. Call us today to schedule your consultation at 254-716-8685. Besides creating a uniform, sleek appearance for your space, garage floor paint can have a multitude of benefits. Much like a concrete seal, these paints offer resistance and protection for your surface. Acrylic paints offer resistance against mold, mildew, water, and fluid staining, and are a very affordable way to brighten your garage. 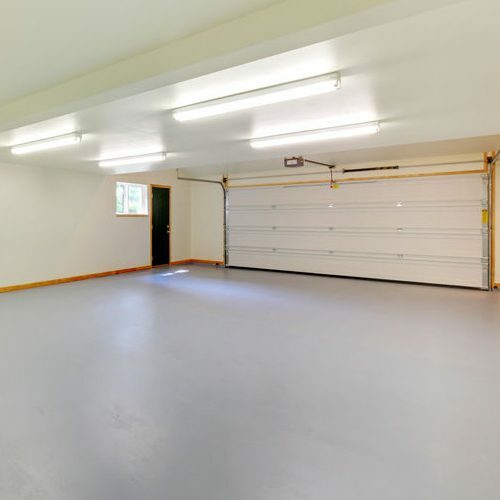 Epoxy mixed garage floor paints are equipped with protective components that can help defend your flooring against vehicle wear, scuffs and stains, and water, mold, and mildew that can come from humid garage air. They can also help create order and organization in commercial spaces. Garage floor paint is available in almost any color you can think of, making it easy to get the look you want. For garage floor painting in Waco and Temple, TX, give us a call! Garage Floor Paint or Coating? Depending on your needs, you may find that a garage floor coating is the style of protection you’re looking for. If your garage is used industrially, for unusually large vehicles, or for heavy mechanic work, a garage floor coating will offer substantially more protection where you need it. However, if you’re looking for a way to revive your space and create a layer of protection against day-to-day hazards, garage floor paint is ideal. To learn more about your garage floor protection options, such as garage floor painting in Waco and Temple, TX, call our professionals at 254-716-8685. Our painting experts provide professional application of your garage floor paint that ensures adhesion, uniformity, and optimal setting of your painted floor. We provide guidance on the best formula for your floor and can deliver details on cost, performance, and lifespan so you always know just what you’re getting. Your garage floor takes a lot of abuse. Make sure it’s protected and looking great with a professional garage floor paint application by our specialists. When you need garage floor painting in Waco and Temple, TX that adheres flawlessly and lasts for ages, call our experts at 254-716-8685. Updated on March 21, 2019 at 1:13 pm by eSquared Asphalt Maintenance.